CACOCO is a whole chocolate crumble that offers an authentic cacao experience. This is not processed cocoa powder! Be sure to vigorously whisk or blend into hot water (or milk) for about 30 seconds, or until the product is smooth and creamy. 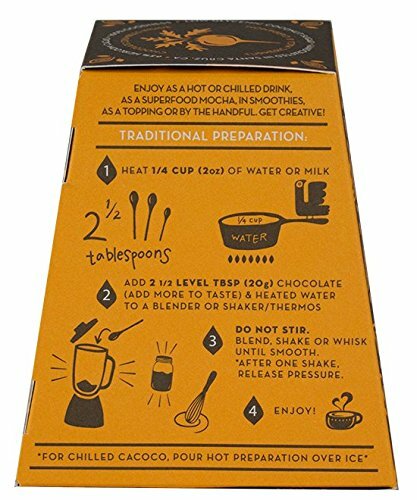 Enjoy as a hot or chilled thick cacao drink, a classic hot chocolate, as a superfood mocha, in smoothies, as a topping or by the handful. Get creative! Gather your strength with an energizing chocolate blend of superfood herbs and spices, with notes of turkish coffee & masala chai. Our ethically sourced, heirloom cacao is harvested from Ecuadorian farms applying ecological and regenerative practices.